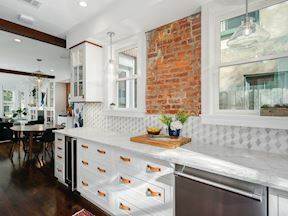 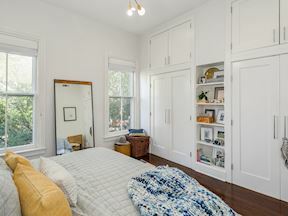 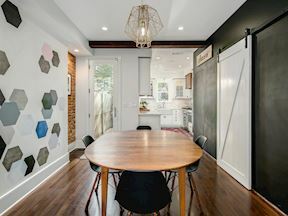 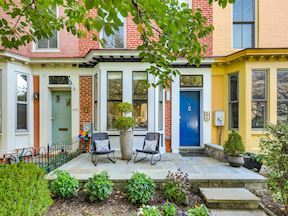 Built in 1870 on a beautiful tree-lined street, steps to the bustling 14th Street Corridor, just north of Historic Logan Circle, 1450 T Street, N.W. 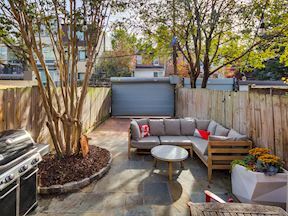 is distinguished by a meticulous 2015-16 gut-renovation sited on a large deep lot with a rare setback, providing ample space for gardening and outdoor entertaining. 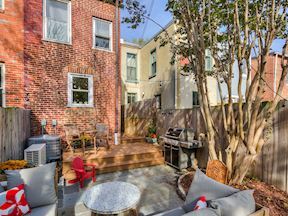 The bespoke 15’ wide, 3-story brick townhouse, with tall ceilings, is offered in impeccable condition. 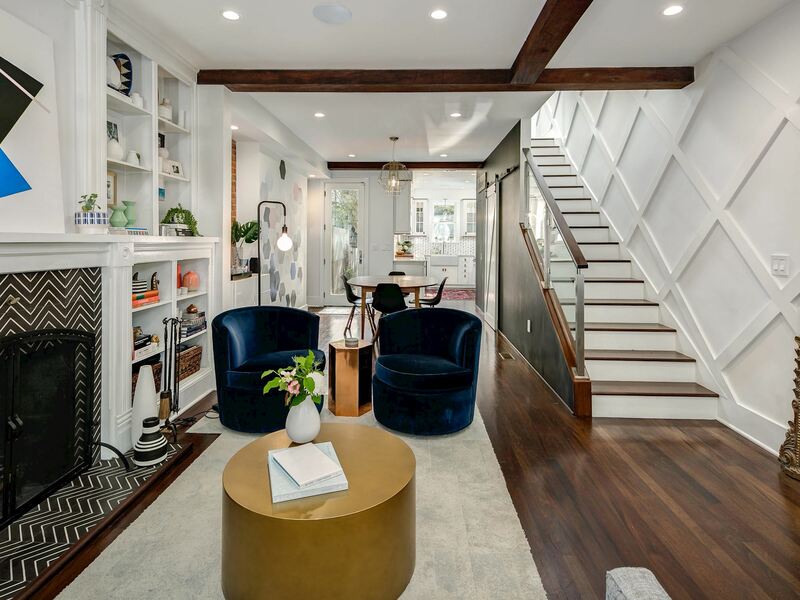 From the Carrara marble kitchen and baths, Mahogany wood flooring and finished lower level to the open plan, frameless glass balustrades and stunning feature wall. 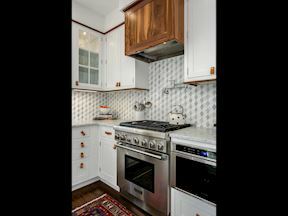 No detail has been overlooked to make this luxurious townhouse a wonderful family home, you really can have it all, complete with the extraordinary interior design!! 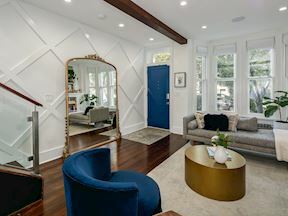 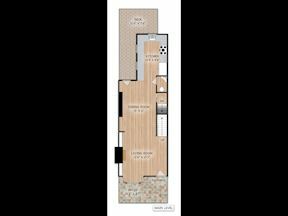 A gracious entry level, open plan with high ceilings and mahogany hardwood flooring boasts a stunning millwork lattice-motif feature wall and elegant foyer mirror. 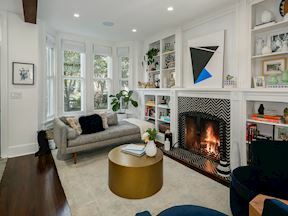 The living room is inviting with a clé tiled fireplace, white built-ins surround and a wide frameless glass-enclosed mahogany stair. 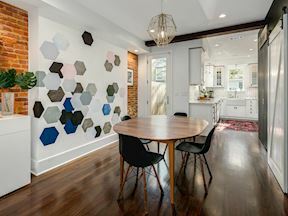 The open dining room features a hand-painted mural wall and a tall glass door opens to the private rear garden with a Southern exposure, a new high-performance deck and horizontal privacy fence, limestone and brick terrace with mature plantings for entertaining and secure parking with garage door. 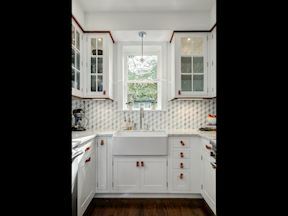 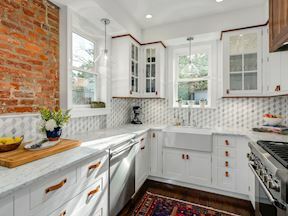 Southern sunlight spills through rear windows into the expanded Cook’s Kitchen. 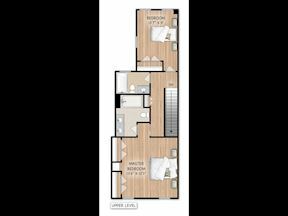 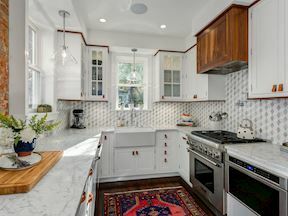 Any chef will delight in the custom white inset cabinetry and white Carrara marble countertops, the stainless steel Thermador Professional appliances, include a 5-burner, dual fuel range, French door refrigerator, smart dishwasher, plus under-counter Sharp microwave and Marvel wine cooler. 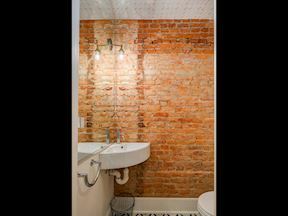 A secret European powder room with exposed brick wall and marble flooring plus a barn door to the basement completes this level. 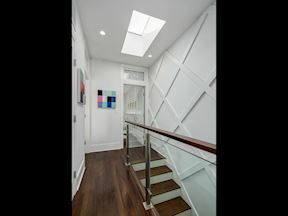 Ascend the glass enclosed stairway to a beautiful upper gallery hallway with frameless glass balustrades, skylight and feature wall. 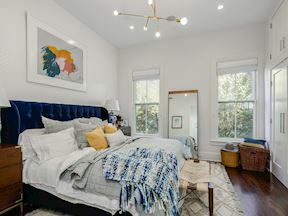 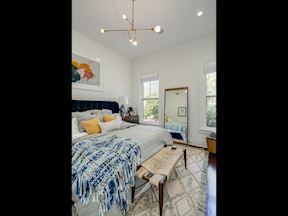 The luxurious private master bedroom boasts pleasing tree-top views, 11’ ceiling and custom closets, en suite is a luxurious white Carrara marble bath with black honeycomb tile flooring, grand casement shower doors and sunny skylight. 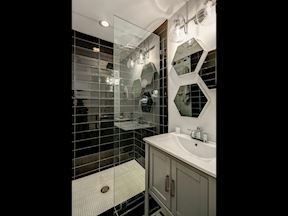 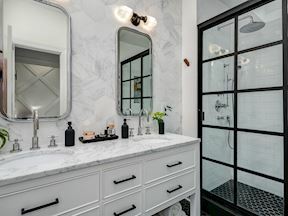 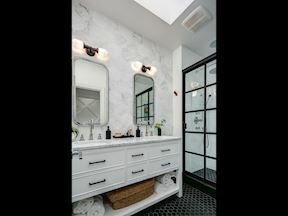 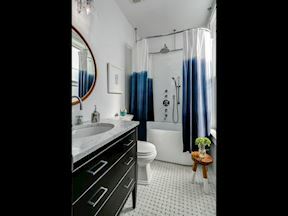 A bright rear bedroom with custom closets is steps to the beautiful, sunny hall bath with white Carrara marble, elegant free-standing tub and spa rain shower. 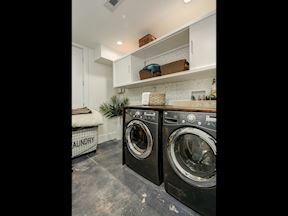 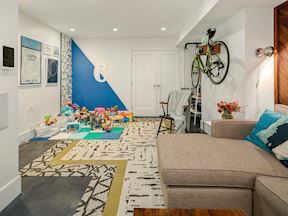 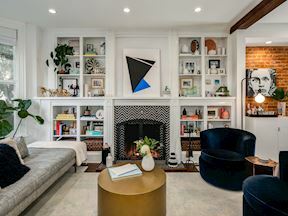 A full basement with custom-stained concrete flooring and 8’ high ceilings includes an open family media room, a full bath in classic black and white ceramics and a large rear laundry room with custom shelving and a full size washer and dryer. 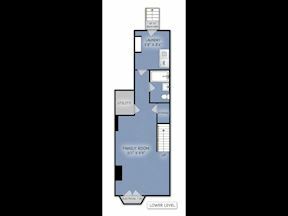 There is a whole house media system with speakers in every room and a surround sound entertainment center. 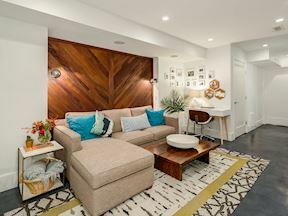 The house is fully wired for security, a Nest manages zoned heating and air-conditioning, and Sonos, the sound system throughout. 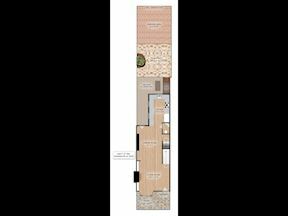 Deep Lot Front & Rear!